Hotel Captain-club Dneprovsky in Kiev: location, room description, restaurant, rates. Information on hotel Dneprovsky. Kiev hotels. Sights: Podol, Andreevsky spusk, St. Michael’s cathedral. 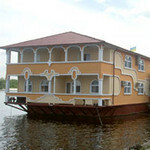 Hotel Captain-club Dneprovsky is located in Kiev downtown practically, on Dnieper front. 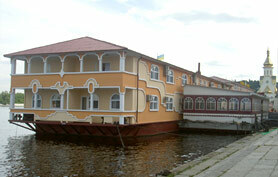 This on-the-water hotel is one of the few similar in Kiev. The hotel is 3-star and disposes of wide set of facilities necessary for comfortable rest. Near to the hotel there is a protected parking place. 20 crew spaces of deluxe and superior categories are intended for hotel Captain-club Dneprovsky guests. All rooms are furnished and equipped so that the hotel guests could feel cozy and fully relax after eventful day. In hotel Dneprovsky there are restaurant, bar, sauna and billiards.